The key event this week in the Levant theatre was the beginning of the battle for Mosul. Iraqi forces successfully broke through the first lines of defence. To counter-attack, ISIL militants, having spent the last few weeks strengthening their defence positions, are focusing on trying to block access to the city. In Iraq, the first days of the battle for Mosul have gone according to the plan implemented by the Coalition's Inherent Resolve operation. The units deployed have advanced by tens of kilometres since the week began, but are up against a highly-organised defence and the roads needed to advance have been systematically booby-trapped. In a bid to maintain its media profile and deflect attention from its military defeats, ISIL has led a string of attacks and suicide bombings. Several terror attacks have been perpetrated in Baghdad and in the area around Ar-Rutbah, in Al-Anbar province. In Syria, ISIL's loss of the village of Dabiq is symbolic, but nonetheless constitutes another defeat for the terror organisation, which continues to withdraw towards Al-Bab. Across the entire theatre, the pace of operations has increased since the beginning of the Iraqi armed forces' offensive to liberate Mosul. The offensive has been launched following preparatory operations by Coalition aircraft. The air component of the Chammal operation is pursuing its missions. Coalition air operations have, as a result, intensified since 17 October. 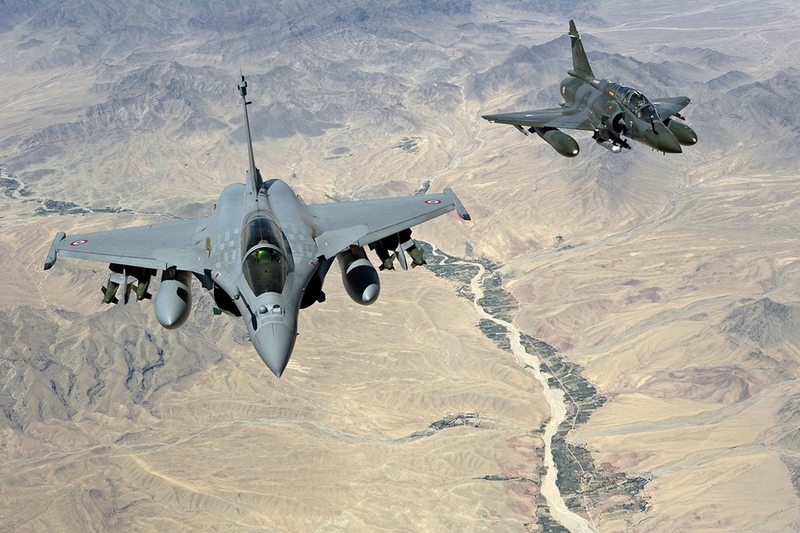 Requests for support from the units engaged in fighting on the ground have led to an increase in the number of strikes carried out by French aircraft. Between 17 and 18 October, 10 strikes were made by French aircraft, resulting in the destruction of 13 targets. - 9 ISR flights, made by Rafales or the ATL2 patrol aircraft, while airspace command and control aircraft carried out 3 operations (5 sorties made by E2C Hawkeyes and 2 sorties by E-3F AWACS), plus 3 air-to-air refuelling missions by the C-135 FR tanker aircraft. - 53 armed reconnaissance flights deploying Rafales resulted in 15 strikes and the destruction of 21 targets. One planned strike was also carried out during the night of 15/16 October 2016. This formed part of the last phase of preparations for the Mosul offensive. Three French Air Force Rafalesand four French Navy Rafales, using SCALP missiles, hit an IED production warehouse (improvised explosive devices) in the region around Mosul. As part of the Coalition forces, the Wagram Task Force has been pursuing action from the Q-West advanced operational base, providing support to Iraqi troops engaged in the battle for Mosul nearly 30 kilometres to the north. This week, the TF carried out 12 fire missions, mostly interdiction fire missions aimed at preventing ISIL from taking up favourable positions or to block its advance. The security situation in the SSS has, in general, remained calm. The key event of the week in Mali was the return to school in the city of Kidal, which took place in the presence of a representative of the Malian authorities, while in Niger, the Niger Armed Forces were mobilised to deal with a string of terror attacks, including putting a stop to an attack on Koutoukalé prison on 17 October. he Barkhane force completed relief operations this week. It is continuing to upgrade its capabilities, in three main areas: mobility (related to improved weather conditions), modernisation (the arrival of Tigre, Caïman helicopters and Reaper drones), and effective support systems (Caesar, Tigre, Mirage). Thus, on Sunday 16 October 2016, three Mirage 2000 Ds from mainland France were deployed to Air Base 172 in N’Djamena, in Chad. These aircraft join the fighter component made up of four Mirage 2000 Cs and Ds already deployed and the projected air base (BaP) in Niamey, in Niger, thus increasing response and flexibility capabilities available to support all French troops deployed in the SSS at short notice. Support provided by the air component is essential for conducting operations on the ground. For the troops on the ground, they are true guardian angels, able to respond swiftly with air support and, if needed, to strike planned or opportunistic targets. In addition to the crew, each consisting of a pilot, a navigator and three ISR experts, there are also nearly 40 highly-specialised mechanics who work to ensure that the aircraft are available at all times. These technicians are in charge of preparing and servicing aircraft before and after every mission, as well as carrying out repairs and maintenance on the various aircraft systems (airframe, hydraulics, avionics, optronics, oxygen, utility environment and mission preparation). 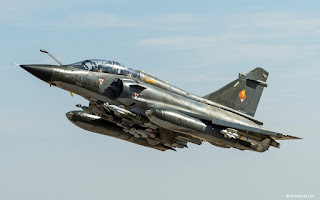 The team of weapons technicians called PETAF (pyro électrotechniciens des artifices et fusées - missiles and explosives pyrotechnics engineers) is responsible for all the weapons that a fighter aircraft may deliver, as well as for ejection seats.